But when Julia Indichova made the rounds of medical doctors and nontraditional healers, she was still unable to conceive a child. It was only when she forsook their financially and emotionally draining advice, turning inward instead, that she finally met with reproductive success. 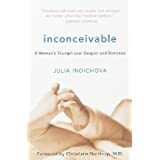 Inconceivable recounts this journey from hopeless diagnoses to elated motherhood. -- The Infertility Cure gives women an effective, natural means of supporting and understanding their efforts to get pregnant. 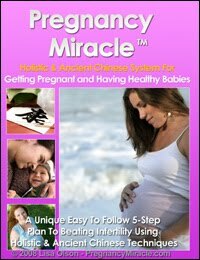 Based on techniques and remedies drawn from traditional Chinese medicine, this book shows readers how to increase their overall health and well-being, strengthen the organs and systems vital to reproduction, heal specific conditions that may affect fertility, and even support Western-based reproductive technology such as IVF and hormone therapy. -- We are not ‘victims’ of infertility. For most of us, our past choices brought us where we are today. You need to accept yourself where you are with no regrets. Many women in their late 30’s and 40’s didn’t want children early in life. You certainly are entitled to change your mind without feeling like you owe anyone an explanation. I found that society in general is critical of ‘older’ women having children, but the same standard doesn’t seem to apply to men. It’s your life and you are entitled to everything it has to offer. 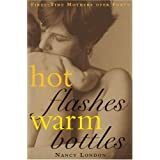 -- Written in a way that speaks to the soul, Hot Flashes, Warm Bottles gathers the insight and emotion of these forty-something moms as they share their personal trials and triumphs in a new era of motherhood. Their stories are often humorous, sometimes surprising, and always comforting. Reassured and inspired, the reader knows she is not alone. This one-of-a-kind guide provides a wealth of advice and creative solutions to help the older first-time mother. Hot Flashes, Warm Bottles brings a powerful sisterhood to modern motherhood with quotes and stories that read like the voices of many cherished friends. -- In Ready, Elizabeth Gregory tracks the burgeoning trend of new later motherhood and demonstrates that for many women today, waiting for family works best. She provides compelling evidence of the benefits of having children later —by birth or by adoption. Gregory reveals that large numbers of women succeed in having children between 35 and 44 by the usual means (one in seven kids born today has a mom in that age range), and that many of those who don’t succeed nonetheless find alternate routes to happy families via egg donation or adoption. And they’re glad they waited. -- The traditional childbearing ages for women have been 20-29. Today, however, the trend to later child-rearing is significant, with the numbers of mothers over the age of 35 having grown 75 percent in the last decade, while the numbers in the traditional ages continue to decline. But I Don't Feel Too Old to Be a Mommy! is the first and only book to fully address the concerns of the ever-growing but greatly ignored audience of literate, educated women who have delayed motherhood. -- Fertility is the major area of concern for women over 40 seeking to become pregnant, not least because of the abundance of negative statistics that serve only to cause unnecessary anxiety and decreasing hope. The truth is that may women have the ability to conceive naturally well into their forties and to give birth to perfectly healthy babies. The aim of this book is to help you maximize your chances of conceiving after the age of 40, taking into consideration all aspects of health and natural therapies to enhance fertility. It is not necessary to practice every therapy recommended within this book and my advice would be to assess your health as a whole initially and then choose a program that you feel will suit your personal needs. -- What's a woman to do when she's facing menopause, toddlers, and elder care all at the same time? Women who have "been there and done that" provide some insight in Midlife Motherhood. Offering humor, warmth, and frankness, this is a hand-holding guide for the uninitiated. Who Else Wants to Have a Baby over 40? -- Does this sound like you? You want a baby of your own. You have spent years in your career and now realize you need to try to have a baby NOW. Maybe you thought you would meet and marry the right man and then have kids. You never found him and now you’re over 40. He never showed up. Lots of other women over 40 have gotten pregnant – you can too! This is not a story about extreme trauma and loss but one of perseverance and hope. I have not been through IVF or anything more invasive than IUI. I don’t have a story of extreme devastation to tell. I had heartache and miscarriage, but got pregnant and had a healthy baby at 45. 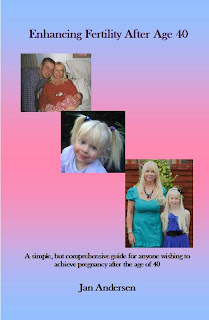 -- Packed full of useful tips from top medical experts, scientists and world authorities, including Dr Michel Odent and Dr Marilyn Glenville, this book is a complete guide for the woman who's lived a life before giving birth. It covers: preparing for pregnancy and motherhood; how to improve egg quality and prolong fertility so you can get pregnant naturally; exercises, relaxation techniques, mind-body connection for conception; how to increase your chances of success at IVF; making the most of your pregnancy, month by month; ways to avoid miscarriage; pregnancy yoga and natural remedies for common pregnancy ailments; how to have the best birth possible; from me to mum - adjusting to lack of sleep, relationship changes and that other job. Get ready to embrace the biggest, most exciting transition of your life! 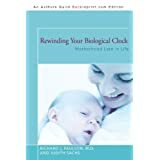 -- Rewinding Your Biological Clock is a unique exploration of each of these issues, especially the "how to" of peri- and post-menopausal pregnancy. It tells the story of forty-eight-year-old Sarah, a woman who decides to become a mother after she is no longer physiologically capable of conceiving without technological assistance. We learn about her motivations, her fears, and her hopes, and see the hard decisions she must make about the difficult--but ultimately rewarding--process ahead. Alternating with Sarah's story are chapters that explain the medical procedures involved, including a step-by-step guide to the process of egg donation as well as other reproductive technologies.